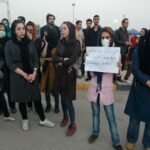 HRANA News Agency – The Ahvaz inhabitants carried out another rally against the level of air pollution in city, on Thursday. 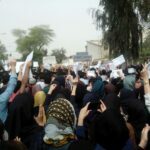 HRANA News Agency – A number of people of Ahvaz gathered in front of the Khuzestan Governor office to protest against the method of dealing with the dust wave in Khuzestan Province. 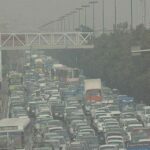 HRANA News Agency – Residents of Khuzestan Province are experiencing difficult days following the unprecedented increase in air pollution, which has put life of thousands people in danger and has hampered peoples normal lives. Residents of Ahwaz Breath Dust instead of Air! HRANA News Agency – The following is a pictorial report of the climate problem in Khozestan province, especially in Ahvaz, and its margins. As you can see, the citizens of the region breath dust instead of air. HRANA News Agency – On Friday, a group of Ahwaz citizens participated in a spontaneous protest against the pollution in this city and demanded the city’s leaders to deal with air pollution and dusts. The rally was held while Ahwaz schools had been closed due to bad weather conditions. HRANA News Agency – The administrator of the company of controlling Tehran’s air quality, air pollution costs Iran 8 billion Dollars each year.